The 286 miles between Bozeman and Miles City, Montana might as well be a journey from Mars to Earth. Mountains give way to badlands and the boom-boom New West slowly reverts to archetype. Although it takes but four hours to traverse our own version of the Treasure State autobahn, the landscape shifts from eye grabbing white summits held high to a horizon that offers little visual relief, except by sky. This is nomad country. Always has been and always will be. 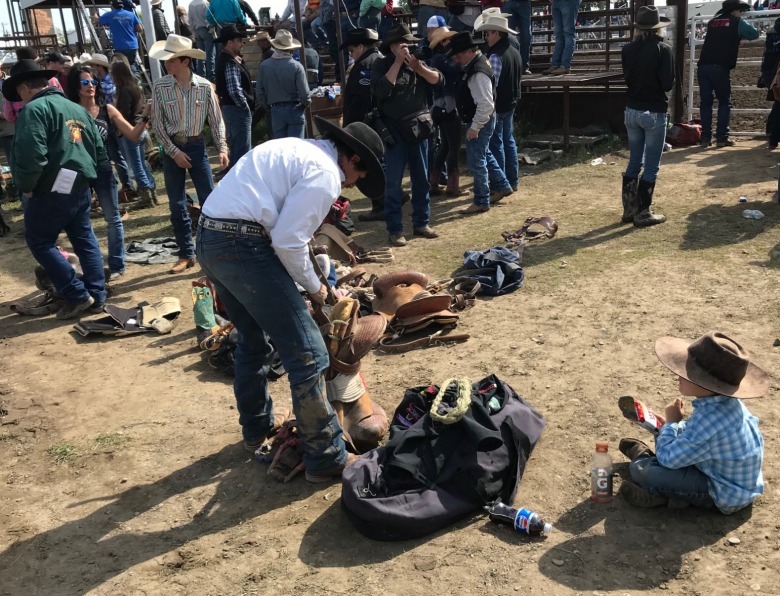 There are no excuses among cowboys, none offered or accepted. There is a dignity to the hardships in this way of life that, out here, is treated as forever yet has only been around for four, maybe five human generations. Before that, a culture built on buffalo hunting and seasonal human migration and never lugging around the stuff you didn’t need. Self reliance has taken on different transcendent philosophies, depending how you identify as a native Montanan. Miles City is my Montana home away from home. It’s the kind of outpost where the fella considered quirky to an outsider might just be the guy who comes along after firm drenching rain, like is falling this evening as I write this, then hooks your bumper bolt to his pick-up and pulls you out of the clay gumbo rut you slid into. Were he not there, your transport would’ve been buried for a week. And there's no reliable cell service to phone AAA. 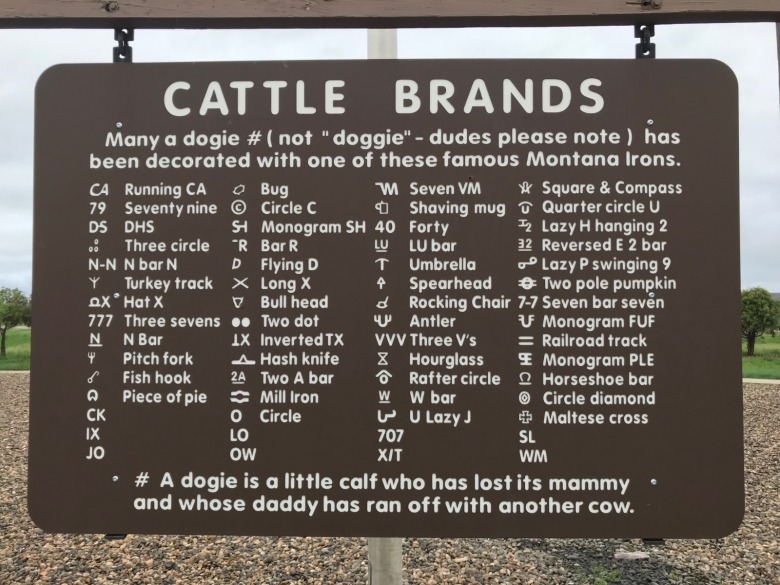 To me, eastern Montana is a kingdom of cowboys and cowgirls and Miles City, named after the Civil-War-era general turned notorious Indian fighter Nelson Appleton Miles, is its capital. A New England Yankee by birth, he's buried in Arlington National Cemetery. I am here for my sister’s 86th birthday and to accompanying her to the annual Bucking Horse Sale held every third weekend in May. The Burlington Northern hundred car coal train blares its whistle while crossing the Tongue River iron trestle bridge out beyond the Custer County Fairgrounds where rodeo stock, both bulls and horses, pace in their respective paddocks eager to buck out of the gate when released ejecting their riders into deep space. Rough stock rodeo animals are the only ones that aren’t bred to be tamed and made more docile for easiest human handling. 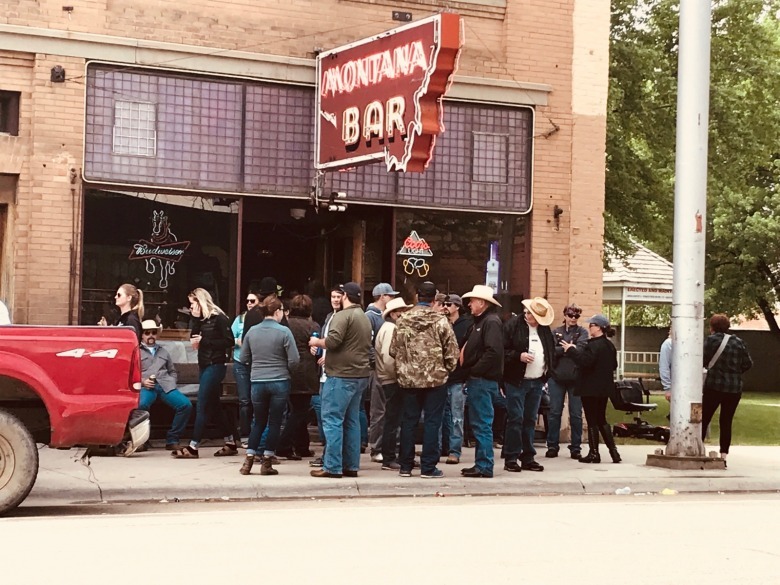 Driving from the mountains of western Montana to the ceaseless grassland plains of Eastern Montana involves a transition from one mindset about Montana to another. It’s like meeting distant relatives for the first time who share your surname, but speak another language, wear different clothes, look different, and eye you suspiciously in a way that confirms you ain’t one of them. "Eastern Montana involves a transition from one mindset about Montana to another. It’s like meeting distant relatives for the first time who share your surname, but speak another language, wear different clothes, look different, and eye you suspiciously in a way that confirms you ain’t one of them." Bozemanians do it, too; tribal values are announced by the uniformed attire we wear. The worst thing you can be is a poseur. Once you get east past Billings all bets are off. If there was a toll booth on the invisible border between western and eastern Montana that begins where I-90 heads south to Sheridan, Wyoming and I-94 keeps heading east to Bismarck, N.D. you would have to pay the toll on I-94 in silver dollars, the currency still being used in Miles City when I worked its surrounding alfalfa fields, irrigated with water pulled out of the Yellowstone River, in 1963. That idea of currency worth its silver is still the medium of exchange here. Sure, it's no longer a silver dollar but what you are charged for in terms of service rendered or bought, still actually reflects its fair value. Price gouging is considered dishonorable. Don’t get me wrong. Even though the living room I sit in writing this column in 2018 is the same living room where I sat waiting for the Mather brothers to come pick me up for the work day on their Yellowstone River bottom irrigation fields. They showed up driving a 1950 Ford Coupe. This house, two doors down from General Miles’s historic abode, is the most enduring sense of place I have, and yet as an adult we managed to live here for but three years in the late 1970s and early 1980s before getting wind of Bozeman and moving there in 1982. Why, you might ask, did we leave? Isolated agrarian communities possess their own kind of stability, rooted in the soil and idyllic changelessness, but mundane to a provincial degree: “Ain’t nothing new but the dog died.” And in so saying the Janus nature of our state is exposed. The persona of western Montana is informed by the Rockies and rivers in a way that supports expansion, of athleticism, commerce, research and tourism whereas eastern Montana survives on livestock and crops. One world thrives on the dreams of transplants and the other survives on unforgiving manual labor and expectations that things will not, and should not, change quickly. I identify with the latter. This distinction was made clear while standing on Main Street in Miles City watching the Bucking Horse Sale parade. He was actually from New Jersey, but to her it was the same difference: an ostentatious attitude cloaked in an attempt to mimic local custom and garb. The Bucking Horse spectacle represents the character difference between our two halves. Our Sweet Pea parade in Bozeman prohibited the tossing of candy and schwag from parade vehicles years ago, worrying about the danger and liability. In Miles City not only is that not a concern but watching the kids dart across the street around horses, tractors, and antique cars prompted hoots and hollers of encouragement from the crowd. 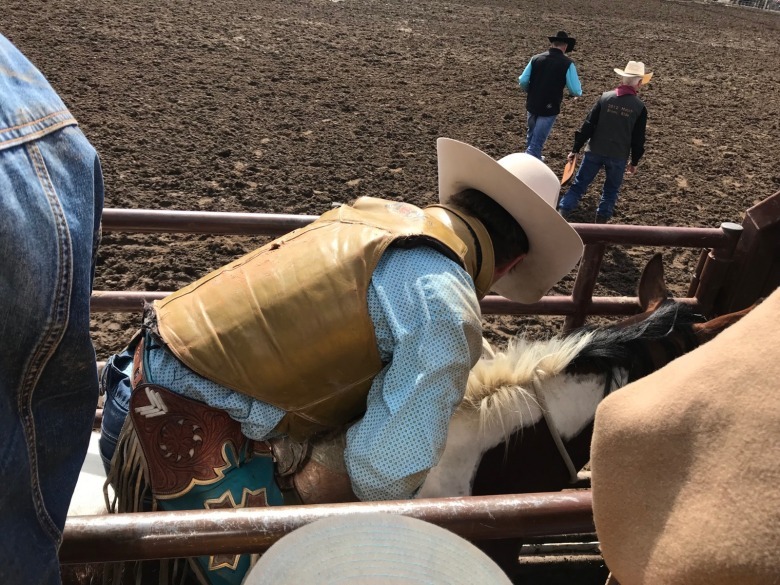 Like climbing on the back of a bronc or bull, that which doesn’t kill you or break your back leaves you temporarily feeling stronger, at least in spirit. Is that the key word here? Have we surrendered the western Montana landscape to over displays of pretentiousness? Is that why folks wait in line for a seat at the table of the Western Cafe taking selfies at the counter, jack-a-lope hung on the wall behind them? Are we trying to capture a western feel without suffering its surcharge—hardship? "I swear if a tourist, should they even find downtown Miles City beyond the interstate, attempted a selfie in his joint, its crusty owner, Butch, would order them out. And good on him." The counterpart to Bozeman’s Western Cafe in Miles City is the 600 Café. I swear if a tourist, should they even find downtown Miles City beyond the interstate, attempted a selfie in his joint, its crusty owner, Butch, would order them out. And good on him. I know he closed the Hole in the Wall restaurant’s kitchen during the sale weekend to protest encroaching food trucks. I don’t mean to be solipsistic. What I want to convey is that our dear Montana is under siege and my nostalgia for the meadowlark’s song on the alfalfa field fence and the rattlesnakes rattle on flat stacked sandstone rocks represent an agrarian ideal of hard working honest people who don’t need to impress. The shiny hipster ambiance of Bozeman. Missoula, Big Fork, and Whitefish sparkle with an imported flashiness that is as foreign to ranchers in Ekalaka as would be a windrower drug behind a tractor to microbrew denizens. One side of the state is ever-increasingly about pursuit of pleasure; the other, often feeling left behind or forgotten, is never far from the lash of necessity. And yet there is a mutual call of the wild that Montanans recognize in each other. The toughness required to scale its peaks, climb its ice, leap into the abyss of its snow-loaded runs, wade fish its river currents, harvest its trees, or game for the family table, plow, sow, reap the barley and alfalfa, tend to its livestock, and manage open space cherished by all requires character. It’s the price of admission and part of an ethos that you don’t take what doesn’t belong to you. One can fake it for only so long. Eventually the patina of persona weathers away and one’s true character is revealed. Montana excels at weathering and rubbing people down to their essence, which can be revelatory or frightening. In the summer of 1964, I was employed as a hired hand on the Nebraska Feed Company Ranch outside Winnett, Montana, on the road to Roundup. My first job was to whitewash the rough hewn fence extending either direction from the entrance’s cattle guard. New to the territory and the effect of sun exposure, I forgo the offer of a cowboy hat, thinking it foolish. After I suffered heat stroke the straw cowboy hat I purchased at the Winnett Mercantile became my prized possession. Natural consequences, practical wisdom made profound. My next lesson was taught by “Old Blue” who in his younger Quarter Horse years galloped in Musselshell County Fair horse races. The ranch manager and hands brought me down to the corral, taught me how to bridle and saddle him. Putting my left foot in the stirrup, I mounted the beast. Then, with corral gate swung open, electric cattle prod strategically placed, “Old Blue” reared up and tore out into the sagebrush hardscrabble for, well, about a quarter of a mile, cowboys on their horses hooting in pursuit. No excuses. The stage set was complete with a final set of conditions. Jack, the longest standing hand, took me to a fragrant field. On the perimeter of this alfalfa sea was a line up of equipment: a swather, tractor, windrow rake, baler, and stacker. The field was several hundred acres large. He showed me how to start the tractor and swather and how to attach the equipment to the tractor, ending with, ‘When you are done stacking bales in the northeast corner of the field we’ll find another job for you.” He then rattled off in his ranch pickup. Cut it, windrow it, bale it, stack it. Figure it out was the message. No helicopter cowboying from him. No cell phones either to call and ask questions, just one rotary phone in the ranch house. No Google to consult on how to drive a swather. No room for error when all I could do was learn from my mistakes and hope I didn’t wreck the machinery. And no talk about how hard the work was. The western half of the state has these folk, who abide by this ethos, working the fields and livestock as well. But the invasion of comfort-seeking immigrants to our western valleys bring an attitude of demanding-convenience and entitlement to our land. How many of life’s most important lessons come from taking the easy way out, or by having the means to avoid pain and adversity, or to pretend that there are people and tasks and causes beneath you to engage with? If the good people of Miles City were to create a landscape painting together as a community, what would be in it? Similarly, pose the same exercise to Bozemanians. Open space bonds and conservation easements are so critical and desperately needed as the aesthetic essence of the Gallatin Valley is being transformed forever. Hail the conservators! Yet we are drowning in good intentions as a tidal wave of displaced wealthy claim western Montana as their new home. The pall of hubris, the belief they are owed something, and relentless pursuit of the easy creep into our mountain valleys laying claim to land and community unearned. Let’s not tame Bozeman’s bucking horse. May the demands of Montana’s weather beaten soul break the hedonistic spirit of those who chose to see place and landscape only through the delusional lenses of real estate brochures. 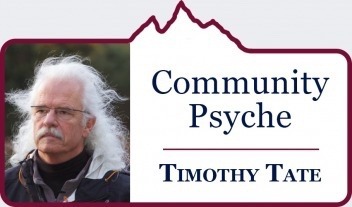 Community Psyche columnist Timothy J. Tate, who lives in Bozeman, Montana, has been a practicing professional psychotherapist for more than 30 years. For decades, he had an office on Main Street behind The Blue Door. He still works with clients downtown.